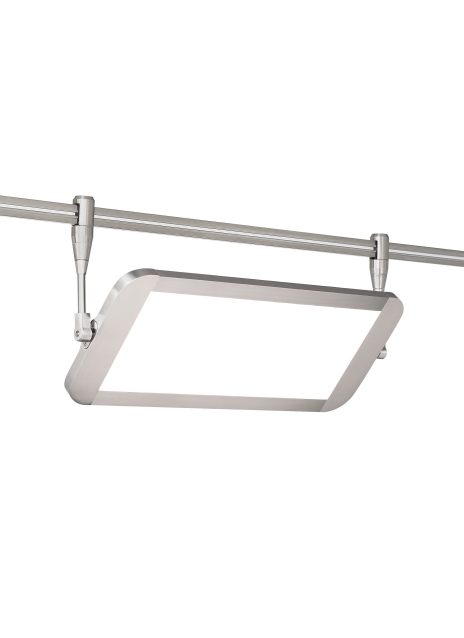 This uniquely designed LED fixture integrates the latest LED light guide technology with the versatility of MonoRail. Each panel head pivots 360° and can be mounted up or down, making it ideal for direct and indirect general illumination, wall wash and display applications. When used in conjunction with other low-voltage heads and pendants, the Lev offers incredible flexibility to layer light throughout a space. This low-voltage display head is ideal for commercial lighting applications such as retail stores, libraries and galleries. The Lev is available in a contemporary Satin Nickel finish and three distinct stem lengths. Includes 12 watt, 753 delivered lumen, 3000K LED module. Mounts to Monorail only. Dimmable with low-voltage electronic or magnetic dimmer (based on the transformer). As a general rule when using the Lev head, we do not recommend using greater than 33% of the maximum wattage specified for the low voltage transformer due to inrush current requirements. For assistance in calculations, please contact Technical Support.